For the last several years, the clever people who put on the famous Twisted Hunt have organized Twisted Krissmuss, a wonderful December event for those who need to shop for gifts with a limited budget. Each participating merchant is required to have one new exclusive that is tranferable and costs exactly 100L. 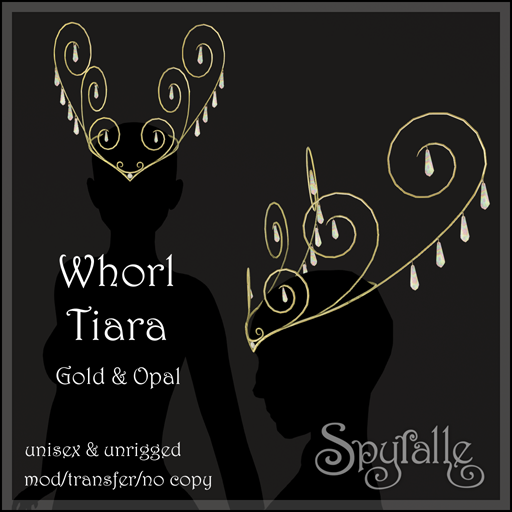 The illustration above shows Spyralle’s exclusive release for Twisted Krissmuss – a spiral tiara fit for the Elvish Court! The event runs through January 2. This entry was posted in New Release and tagged fantasy, Headpiece, Jewelry, Spyralle. Bookmark the permalink.